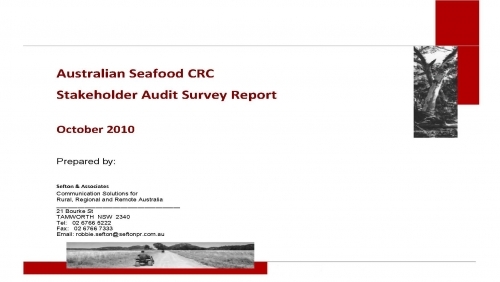 This report is a summary and analysis of the findings derived from a communication audit of the Australian Seafood CRC stakeholders. The purpose of the audit was to inform the development of communication strategies and tools. The audit sought to understand stakeholders' understanding and perception of the Australian Seafood CRC so as to gain insight into the efficacy of previous communication and to identify opportunities for the future. Fifty stakeholders from the Seafood CRC database were interviewed as nominated by the Seafood CRC. This included people from a range of industries and who have a variety of relationships with the Seafood CRC. The response to the invitation to participate in the interview was overwhelmingly positive indicating an interest in the Seafood CRC and a willingness to provide feedback. The surveys were conducted one‐on‐one over the telephone. The survey contained a mix of qualitative and quantitative questions to both obtain measurable data and more detailed views and opinions. The average time for each survey was around 40 minutes. Interviews were conducted confidentially so no names or organisations are associated with the responses. This encourages people to more freely express their views.